Hello, you are on the page "Advertising with DepositFiles service". Here you can find information about advertising with DepositFiles.com, including advertising space and description. The advertising space on the DepositFiles.com is located on three pages: "Gate", "Download" and "Removed files". No disabling of the back button aka "mouse trapping"
"Gate" is the first page where customer is redirected by URL link. 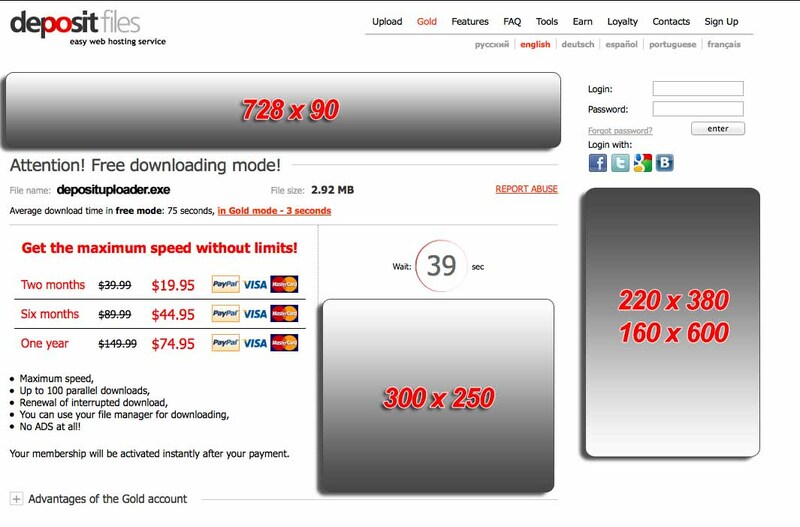 On this page customer is offered to select the type and speed of the download. This page has two advertising spaces. Banners which merge with our brand depositfiles.com (use white background or our logo, use our corporative colors), promo material must be signed with name of company or brand logo of advertiser. "Download" is the page where the direct link for file downloading is placed. The advantage of this page consists in mandatory 60 seconds waiting time for the link. This time is required for user to look around the page and read the banners. The page also has non-standard advertising space, the text below the timer. It looks not as an advertisement but as a part of the site, which helps to focus user attention on the message. "Removed files" is a page which shows the reason of their deletion. According to Google Analytics - 5 minutes mean time of stay. 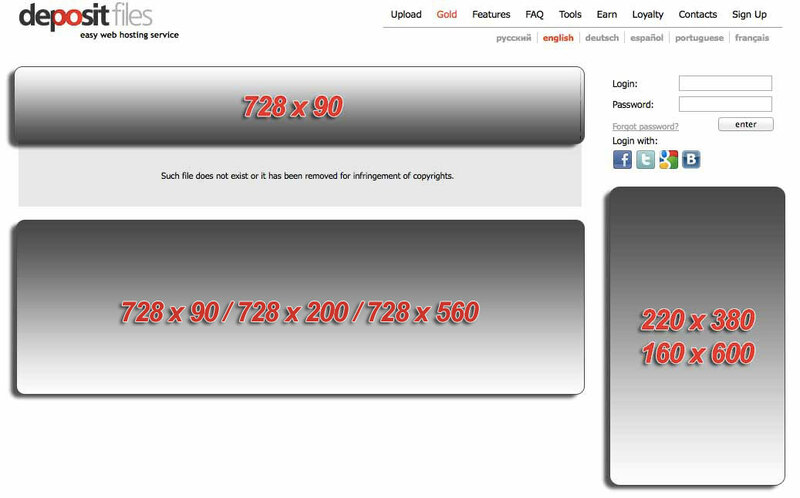 All attention is given to the center on this page, therefore all sizes of banners work fine.